With construction increasingly encroaching the green cover and apartments growing smaller by the day in Delhi-NCR, the only kind of garden one might see is a public park. Often, we yearn for a quiet, green oasis of our own, don’t we? But where’s the space? That’s a good question. Well, here’s what Four Leaf Landscape Has to say: who needs a sprawling lawn for a beautiful garden? Even if your house is low on space, you can create an oasis of your very own in this concrete jungle. The ideas are aplenty and not only will they solve the space crunch but also give your home a fun, quirky makeover. Think box shelves, vertical gardens,Green walls, bio walls and more. All set? Vertical gardens open up the world of gardening to anyone who has a bare wall, or an empty corner. It means anyone, anywhere can grow fabulous decorative plants with only a few feet of space.. As long as you have a vertical surface available and a little time and energy, you can create a vertical garden that defies your expectations. This is possibly the easiest way to work around small spaces in Delhi_NCR. Get small planters that can be hung with a wire or a beautiful L-bracket. Alternatively, you can get cans from your local market (especially the kinds milkmen still carry), paint them in bright, summery colours and just hang them over the balcony railing. You could even take one long rope and tie all your mini planters on it by making three to four knots. Easy-peasy. If you are dismayed that you can’t use any of these other options – think of the one place that every home has. That’s right – a window. Your window might be small, big or medium but it’s there in every room and so, you can still have a tiny garden. If you have a sizeable window sill, use medium-sized flower pots but just make sure they get enough sunlight depending on the type of plant. In your kitchen window, you can have herb plants in mason jars. Want more options? Grab an old, longish wooden box and nail it to the outer side of your window, making sure it’s fitted properly. All you have left to do now is put in some colourful mini planters and you’re set. 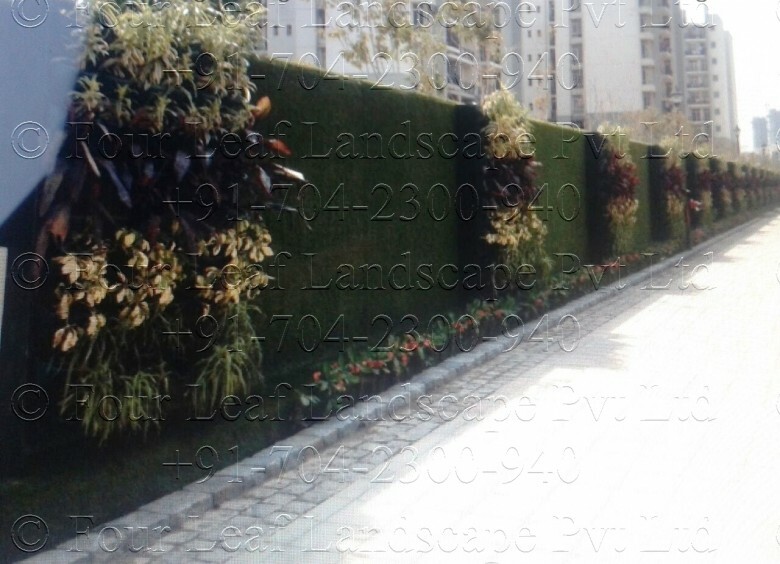 You can call Four Leaf Landscape for Vertical gardens in Delhi NCR. Four leaf landscape is the best solution for providing various landscape solutions. Got any old bookshelves or kitchen shelves that you want to discard? Hold it! Use them to place your plants on instead. You can use old plyboards in your house, if you have any, or buy some from a local vendor and have them attached to the wall. Box shelves, if you have those, look even more quaint and attractive. Get them done in different sizes and shapes (square or rectangular) to give it an artistic spin and voila, you’ve got a fancy addition to your mini garden.